How does it sound like when heaven and earth become one in the golden light of the morning? If you wanna find out, have a listen to the India EP. 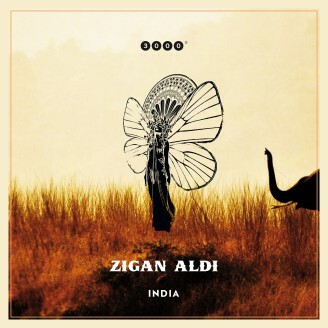 Zigan Aldi delivers two dance tracks of truly epic dimensions. According to an old legend, Nemrut was a king who made peace between heaven and earth. That's why a mountain in Turkey is named after him – and now also a piece of dance music. This piece of music is like the soundtrack for a climb up that mountain: It's a steady rise, opening ever new perspectives on the surrounding soundscape, while at the same time the listener is overcome by an ever growing feeling of harmony. Orha Broka on the other hand is Hebrew and translates to the light of the morning. This track blends enraptured chants and a subliminal psychedelic vibe into highly functional groove. Of course there's remixes, as well. For his Nemrut Remix, Mollono.Bass introduces a subliminal feeling of World Music by adding the sound of a sitar. Umami delivers a remix of Orha Broka that puts a little less emphasis on melody and a little more emphasis on rhythm.